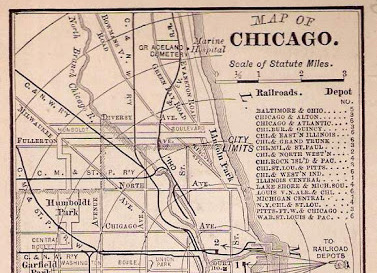 Chicago’s Park Boulevard System was the first major comprehensive park/roadway system in the country, and its design was seminal in the creation of such systems in cities nationwide. 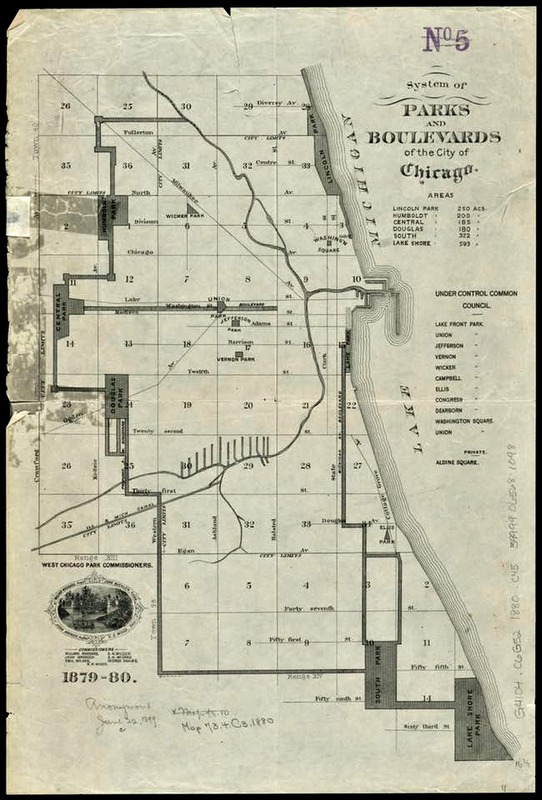 The system’s boulevards and parklands were created in the late 1800's to spur residential real-estate development and to help create healthful, accessible and livable neighborhoods in what was then the largely underdeveloped outskirts of Chicago. 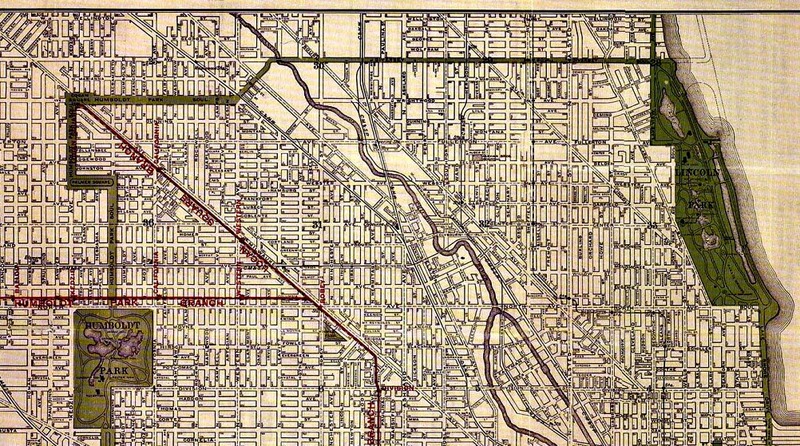 The boulevard system created one of the city’s most recognizable and lasting urban features that helped to define the historic visual character of many of Chicago’s neighborhoods including Lake View. 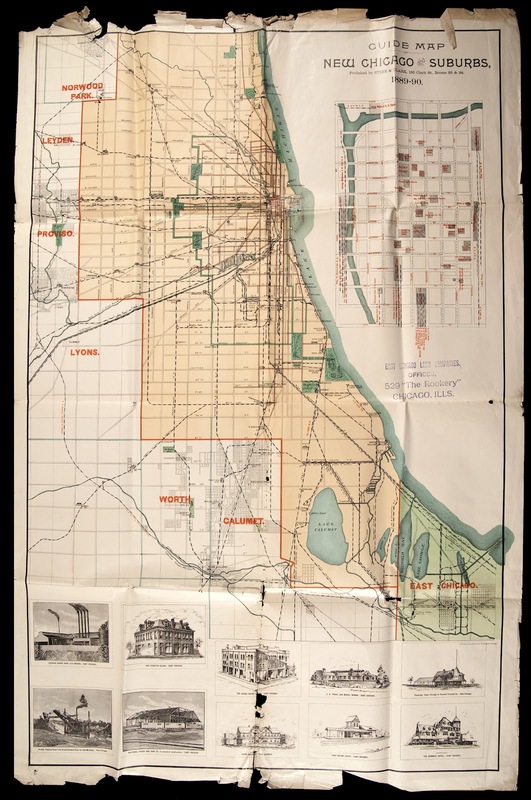 John S. Wright, an early Chicago developer, envisioned a need for beautification of the dusty, dirty communities and underdeveloped areas of the 12-year-old city. Chicago Cemetery furthered the park movement in the 1850's and 1860's. Physician John H. Rauch knew that the water supply was contaminated by less understood disease called cholera. He knew that poor burial conditions in the sandy, marsh like low-lying site caused periodic outbreaks since the 1840's. About same time Dr. Rauch had an romantic interest in the world's most famous park systems. He thought why not here in Chicago. That thought led him to a city-wide crusade to convert the city cemetery into a public park. North-siders rallied behind his cause. In 1860, 60 acres were reserved as a ‘pleasure ground’. Five years later, after the assassination of President Abraham Lincoln, the park was renamed in his honor. 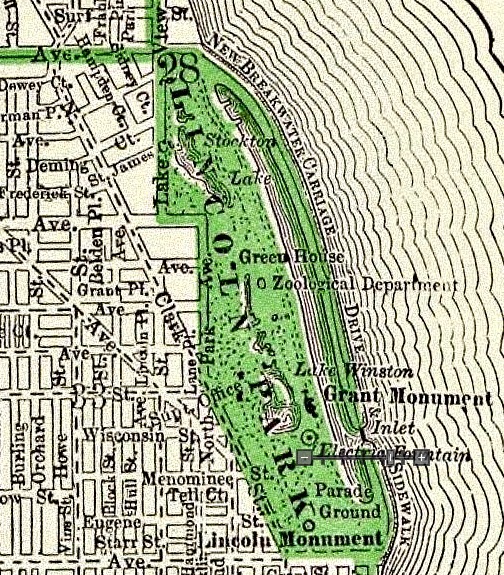 Chicago Cemetery’s function as a north-side cemetery ended by 1870. 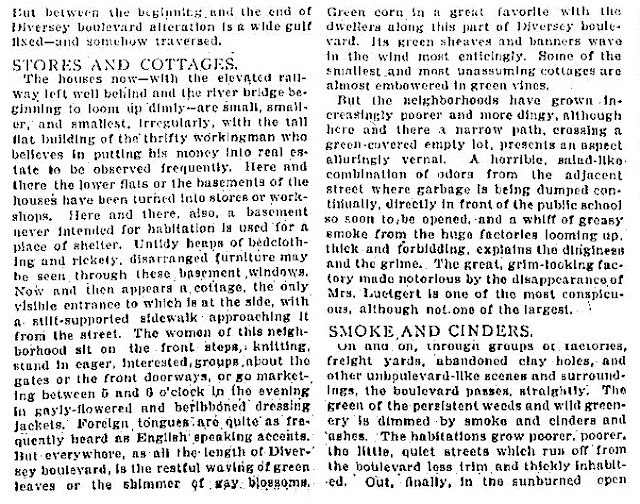 By then, the cemeteries in Lake View Township had become a destination for visiting Chicagoans. 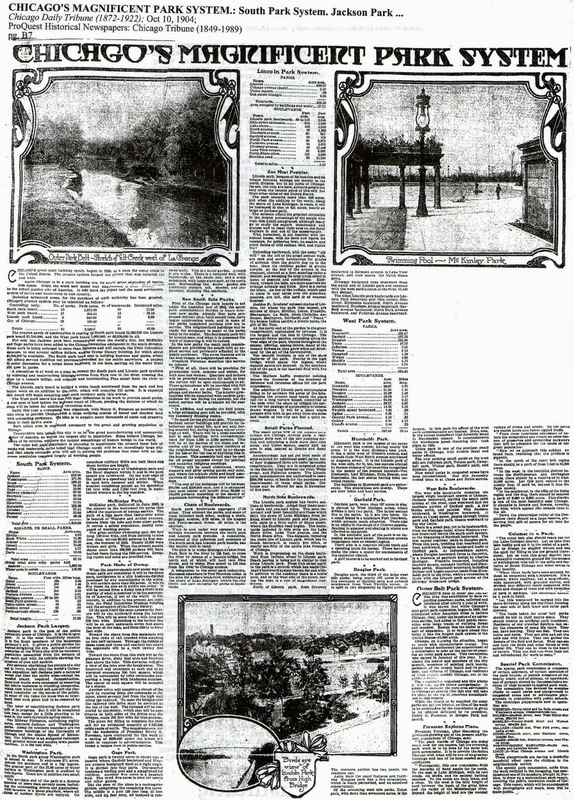 The Chicago Times published an outline based on John S. Wright's concept. 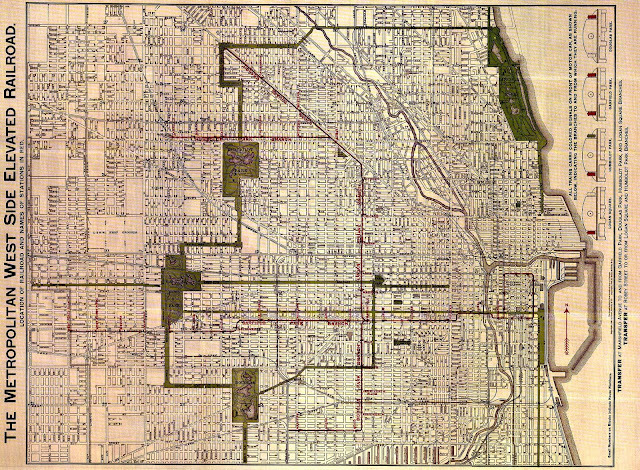 It proposed a continuous encirclement of the city with a 2,240-acre park, 14 miles long by one-quarter mile wide, and boulevards lining each side of the park strip. 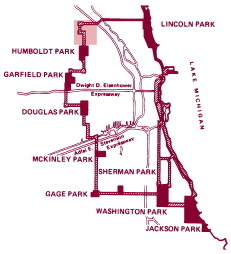 The State of Illinois passed three pieces of legislation creating the South, West and North (Lincoln) Park districts. 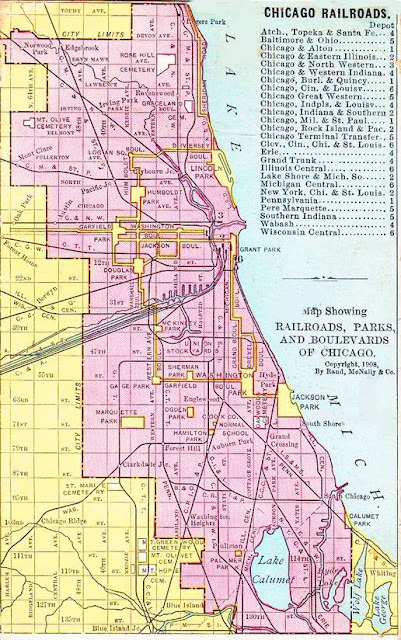 It not only outlined the powers and duties of the park districts, but also detailed the location of the parks and connecting boulevards. 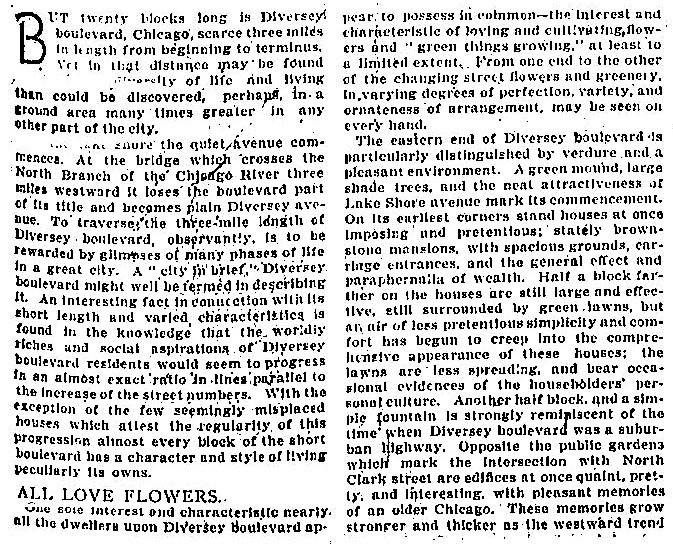 To ensure that the boulevards were ‘pleasure drives’, speed limits were set at a maximum of eight miles per hour in 1871, and all vehicles (horse-drawn) "transporting merchandise, commercial goods, building materials, manure, soil, and other articles" were banned from the boulevards by 1873. Originally, the boulevards served the wealthy, who built their mansions along the parkway. 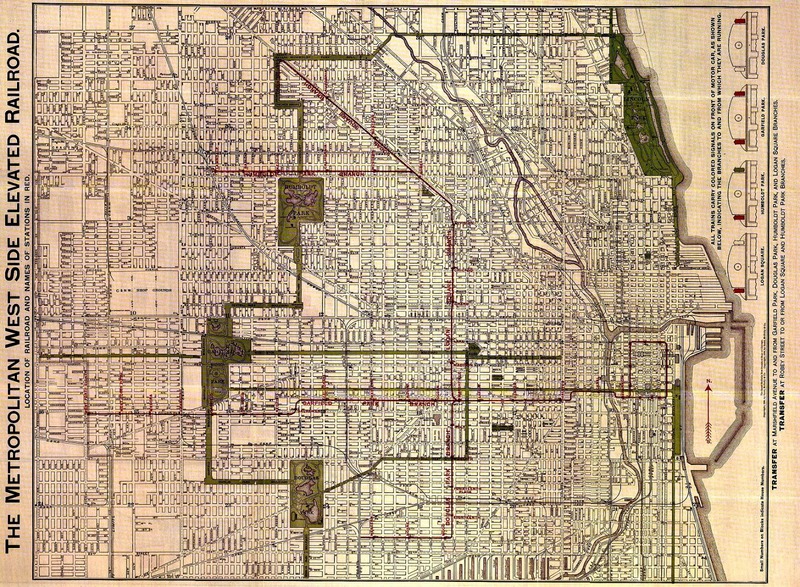 Soon, however, public phaetons (carriages) traveled along the boulevards to permit greater access to the parks by all citizens of Chicago. 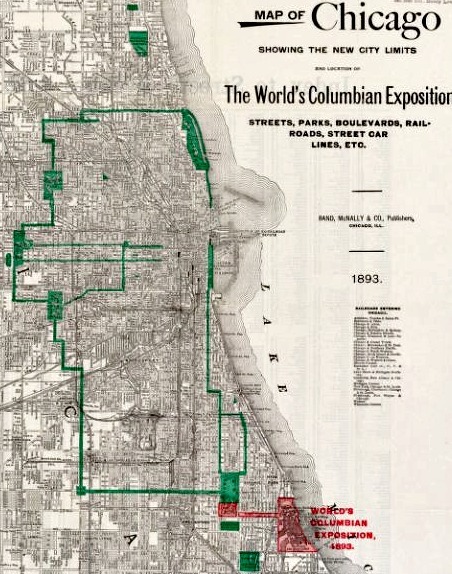 After the Great Chicago Fire of 1871 the North (Lincoln) Park District plan was delayed by litigation over its taxing authority by land speculators who wanted large sums of money for their own property. 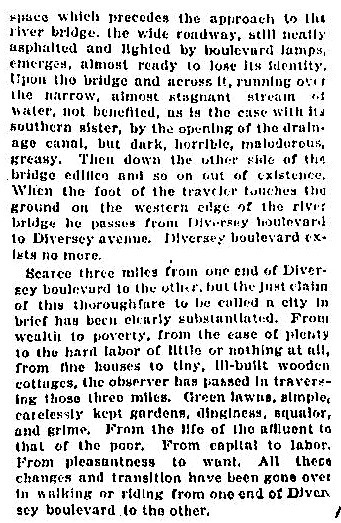 Legal challenges from both land speculators and by the 'anti-taxation' working class and other less affluent citizens of the north-side were resolved by 1875 whereby the taxing authorized district were not empowered by the levy of taxes for the widening of Diversey Avenue. 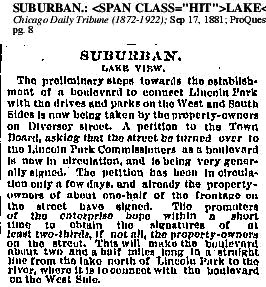 In other words, commercial and residential development by purchase and/or razing hundreds of buildings was to be prohibitive by the citizens of the Township and later the City of Lake View. World War II siphoned off money previously allotted to landscape parkland beautification. Soldiers returned from the war and began families moved to the suburbs where new and affordable housing was offered in abundance. 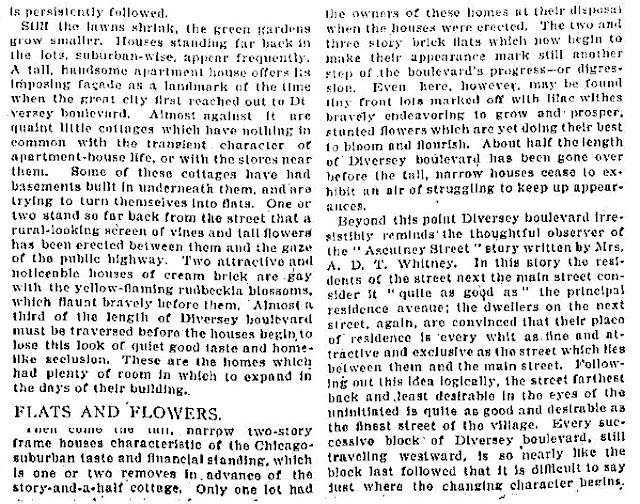 Many wealthy families abandoned their residences along the boulevards and in their place came less affluent families who could not afford the high cost of maintenance of the large buildings. By the 1950's, many sections of the boulevard system began to crumble from neglect, and magnificent mansions razed to make way for less expensive homes or apartments. Since mansions on the south boulevards built in the 1880's were the oldest, decay began there first. Mansions on Kedzie and Logan Boulevards built in the early 1900's were largely spared, since original families still occupied them and could afford the cost of continued maintenance. The Park District relinquished control of the boulevards to the City in 1959, retaining control only of the parks. By the 1950s, the Chicago Park District was responsible for 169 parks totaling approximately 6,300 acres of land. The Department of Streets and Sanitation and later Forestry with reduced budgets have had difficulty maintaining the pristine beauty that originally existed. Like many large cities, Chicago lost population during a move to the suburbs in the 1960's - 1980's. 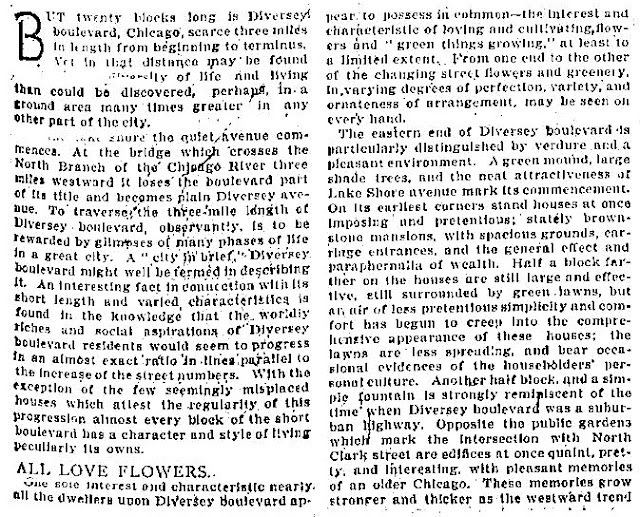 By 1995, Chicago was being recognized as an attractive place to live again and residents saw the boulevards as a hybrid of formal city living combined with the spatial feeling of the suburbs. The visual effect of living near the boulevards with its charming blend of original architectural buildings and immediate access to downtown and the airport via an expressway fueled a desire for new construction. The boulevard would have been located just north of the harbor. Simply, the plan to create the boulevard for this street came to an end when property landowners closer to the existing lakefront with their expensive homes thought that a less square footage of property would mean less value for the homes. 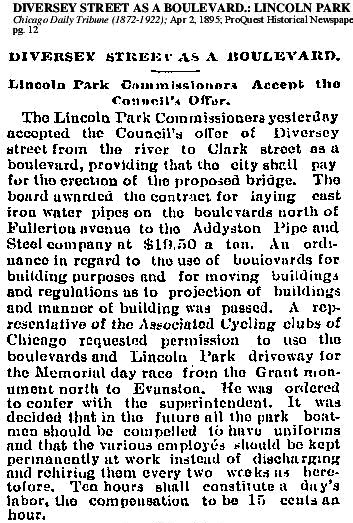 Besides there were a number of manufacturing plants along the street at that time near the north branch of the Chicago River that might have issues with widening, as well. bike ride through the boulevard system via WTTW.